On the twenty first of October, crowds gathered in King Tut’s to present a profound yet electrifying event. When doors opened, the queue already extended itself through and out the famous, King Tut’s bar. Other Humans opened the night with their synth keyboard and their upbeat tones. As they performed, the chemistry of this group was very evident – you could see everyone doing their own thing but focusing on the larger scale one you see how they moved in unison, meshing their work together and making their music flow. Their set list, including their recent track ‘The Valley’, had a wide range of arrangements that raised the crowd’s spirits in preparation for the gig. As the evening progressed, Spring King took the stage. This band seemed to give it all with their performance. It was like listening to George Ezra sing to upbeat versions of Keaton Henson’s songs. With a unique sound, vocals that entangled with the beating of the drum and their chatty humour between songs, they knew how to get the crowd up and running for the night’s headliner. Around half ten, Spector finally took the stage. The Londoners, all dressed in white began their electrifying performance and were very well received by the audience. 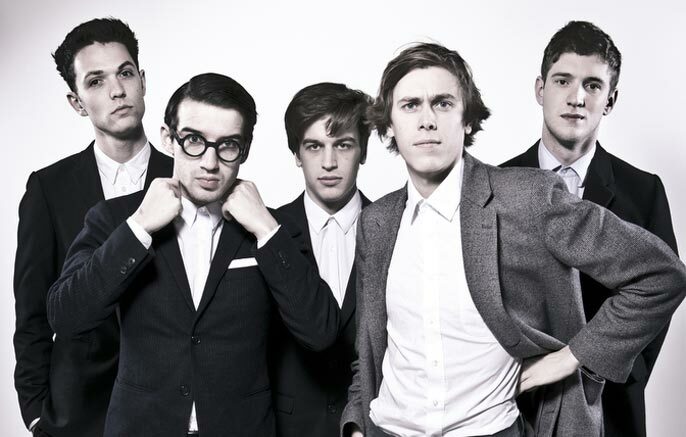 The lead singer, Fred Macpherson, greeted the audience: “Glasgow’s got a premium set list”, and promised they would be “cutting through to that prime rib”. They started off with one of their more recent songs, ‘Cocktail Party / Heads Interlude’, introducing the crowd to their brand new album ‘Moth Boys’. Macpherson got up close and personal with a fan that seemed to be leaving, and promised that he would be walking him to his bus when the gig was done. The venue allowed for a very intimate performance, given that the performers and the audience were within arm’s reach. Macpherson then took some time to introduce the rest of the band; Thomas Shickle on bass guitar, Jed Cullen on synth and guitar, and Danny Blandy on drums and percussions. The gig progressed and the crowd sang their lungs out with the band, following Macpherson’s request “If you know the words feel free to sing along”. When the band performed their 2012 hit, ‘Friday Night, Don’t Ever Let it End’ King Tuts was raised to an aura of exhilaration as everyone danced and moved along with the band. The crowd was living in the music with the band, chanting in unison: “Friday Night, I don’t want to break up alright”. This was the ultimate climax; everyone forgot their worries and let music guide them for a moment. Towards the end of their performance, Macpherson and Shickle requested the crowd to open up an aisle in front of the stage. They sang choruses, encouraging a competitive feel between the sides of the crowd. And as the beat was rising, the songs pace was speeding and Shickle gave the signal both crowds charged towards each other as an electrical discharge that would reverberate throughout history as “The Great Wall of Death, October 2015”. The band concluded by mentioning how meaningful an experience the gig was for them and thanking the crowd for being “such an awesome audience”. And as the crowd poured out, I could read the names of famous bands like Radiohead, Oasis, Coldplay, The Strokes and Franz Ferdinand and their performance dates between feet on the steps – it doesn’t take much to picture Spector there in a couple of years. Posted in Music and tagged gig, Music, review, spector. Bookmark the permalink.